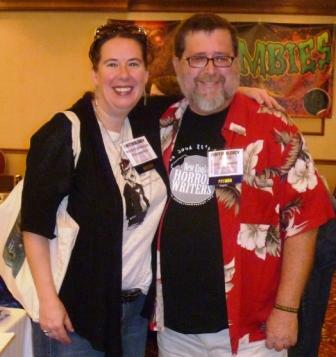 Me, left, at Culture Scary Dairy contest winner Dave Goudsward at AnthoCon 2011 in Portsmouth, New Hampshire, on November 12. My flash fiction piece “Slow Grill” was runner-up in Culture magazine’s annual Scary Dairy Contest (fellow NEHW member Dave Goudsward took first place for “Michael, is that You?”)—he’ll be receiving a basket of cheesy goodies just in time for the Holidays! NEHW member Stacey Longo also entered (her story’s untitled). You can read all three stories here. Posted on November 29, 2011, in News, Short Stories and tagged AnthoCon 2011, Culture Magazine, David Goudsward, Halloween flash fiction, New England Horror Writers, Scary Dairy contest, Stacey Longo. Bookmark the permalink. 2 Comments. Thanks, Peter! I’m glad you enjoyed them! I loved reading them all. I was watching that board daily. They were great reads with coffee!